Does the Porsche Cayenne make you mad? Are you one of those Porsche purists who find the idea of a V6, front-engine sedan wearing the beloved Stuttgart badge offensive? Well, get ready to see red on this one. 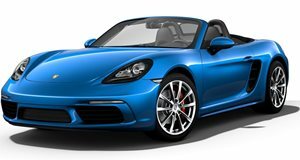 Porsche announced that they would make an all-electric Boxter a while ago, but after seeing the 918, we thought the Boxter E might not be so bad. We were wrong. Two different Boxter E prototypes were built and neither is exactly exciting. The first uses two electric motors to power all four wheels with a total of 241hp, and topping out at 124mph. A rear-wheel-drive variant produces 121hp and runs out of go at 93mph. Range is estimated at a hardly-groundbreaking 107 miles. The one positive side of the story, they didn&apos;t mess with the 911.